Coral Rose is a widely recognized agent of change, strategist, eco-educator, and speaker on the subject of sustainable textiles and the practical application of sustainability to business. For over twenty years, she has held senior management positions in merchandising and product development, including sustainable textile product development for major retail corporations. In 2004, Rose was able to integrate her sustainability values into her profession. She and a co-worker led the Wal-Mart Sustainable Fibers and Organic Cotton Environmental Sustainability Team, which was committed to bringing sustainable fibers to the everyday consumer. The company soon became the world’s largest user of organic cotton, and ultimately, that team was the catalyst for global change. Rose’s role in moving the retail giant toward sustainability has been widely documented initially in Fortune Magazine’s July 2006 feature “The Green Machine” and most recently in “Strategies for the Green Economy” a book by Joel Makower. She has been a featured speaker and panelist at events such as the MAGIC International Textile Show, The ECO-SHOW, All Things Organic (ATO), and Texworld-New York. Rose also is a member of the University of Delaware Department of Fashion and Apparel Studies Advisory Board. The University of Delaware offers a graduate program in Socially Responsible and Sustainable Apparel Business. Rose also created and led the first ”Sustainability Leadership“ Executive Education Course for the University of Arkansas. Rose recently joined National Stores Inc., a 200+ store family-owned and oriented company established in 1962. Fallas Paredes Discount Stores and Factory 2U serve local communities in five states — California, Texas, Arizona, New Mexico, and Nevada. The company is uniquely positioned to serve the emerging U.S. Hispanic demographic population. Rose says she feels that close-out retailers such as Fallas Paredes and Factory 2U are a sustainable channel for fast fashions’ role in mass manufacturing. Fallas Paredes affords the market an outlet for over-runs and canceled merchandise and at the same time serves local communities by providing them with affordable fashion. Stephen Frost is one of the co-founders and an executive director of Corporate Social Responsibility (CSR) in Asia. He is also an assistant professor at the Department of Asian and International Studies at the City University of Hong Kong. He has consulted for numerous companies, governments, and multilateral organizations, and is widely published. He is regularly interviewed by local and international media organizations, and he sits on the advisory boards of major corporations and CSR initiatives internationally. Frost developed and taught the first CSR modules in MBA programs in Chinese universities, developed and is teaching the first undergraduate CSR course in Asia, and along with his co-founder offered the first public training of CSR in the Asia-Pacific. He helped develop an innovative factory training program for Chinese factories, and led a team to develop capacity building for Chinese organizations to deliver service to companies in supply chains. He is a recognized pioneer in CSR in Asia. For two decades, the loudest critics of the fashion industry’s supply chain in China have originated in North America and Europe. Groups like Students Against Sweatshops and the Clean Clothes Campaign have — with local support — been the major actors in shaping business responses to workplace issues confronting Chinese factories. But with the rise of social media (or Internet technologies that allow interactivity) in China, this may be starting to change. Chinese stakeholders are now voicing their expectations of fashion brands using technology like bulletin board system (BBS) forums and blogs. Take the case of Semir, a Wenzhou-based youth fashion brand with 3,620 outlets across China. 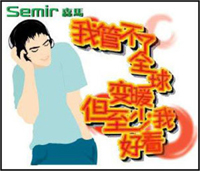 In 2007, the company ran an advertising campaign featuring youth dressed in the company’s latest outfits with the tagline, “I might not be [a sports star, Olympic torch bearer, etc], but at least I look good [in Semir]”. But when they published an ad saying “I can’t deal with global warming, but I look good”, all hell broke loose. Visitors to blogs like “Youth Focused on Climate” and popular BBS forums on Internet portals such as Daqi and Xici were all incensed at what they perceived was an act of corporate irresponsibility. This comment summed up the feelings of many: “What can a company with no sense of corporate social responsibility bring to the public and to society?” It was the first case of Chinese citizens holding an apparel firm accountable online for a CSR issue, and due to the pressure exerted (including articles appearing in influential papers like the China Youth Daily), Semir apologized. A new interactive Web site — http://www.74ligui.com — provides more evidence that Chinese stakeholders are taking action over issues that concern them. In this case, it’s fakes. Based on contributions from the public, http://www.74ligui.com provides detailed accounts of how to spot fakes (the term ligui refers to a product whose packaging is intentionally made to resemble that of a well-known brand). It covers numerous products, but fashion wear is clearly a major concern. The brands covered include Adidas, Bape, Burberry, Calvin Klein, Diadora, Diesel, Evisu, G-Star, Jack Jones, Lacoste, Lee, Levi’s, Nike, Polo, Stussy, and Triumph. Once again, this is a first; Chinese stakeholders are using social media to express views, make expectations known, and play a visible role in shaping corporate behavior. New Web sites like Our Workers (http://www.ourworkers.org/index.asp, a Chinese-language Web site that among other things provides an outlet for apparel factory workers’ voices) are also using the social media to express expectations deeper in the supply chain. A broad range of Chinese stakeholder views has been absent from much of the discussion about the apparel sector and its supply chain. The rise in use of social media suggests that is changing. The real question now for apparel brands is whether they are underestimating Chinese social media, and whether they know who is talking about them and what they’re saying. is partially supported by the U.S. Department of Education.